All companies wish to have a good, strong brand. For many companies, their brand is their biggest asset. The brand value of a leading enterprise can reach billions of dollars. There is no question about the power of branding. However, the common branding process is deficient, and often is only suitable for the previous century’s economy. In this article, I’ll describe what is missing in a typical branding process and how to improve it. Product data management might seem like the dull, formal work associated with any product design workflow. After all, it’s far from being as exciting and challenging as the creative product design and engineering work. However, product data management actually has a great impact on product design and project efficiency, especially when it comes to complex product designs and/or long projects. Accurate and comprehensive product data management is a crucial aspect of the product design workflow and a key parameter for effective product designs and successful products. The three main elements of product data management are CAD files-, BOM- and Product-Brief- Management. In this article, I’ll share some working methods and tips about these three product data management elements. New product design and development is a great challenge. It requires creativity, skills, knowledge and resources—but R&D is only part of the work needed to launch a new product. Production implementation is the process of translating a product design (in the form of CAD files, 2D drawings, and prototypes) into a ready-for-sale product. 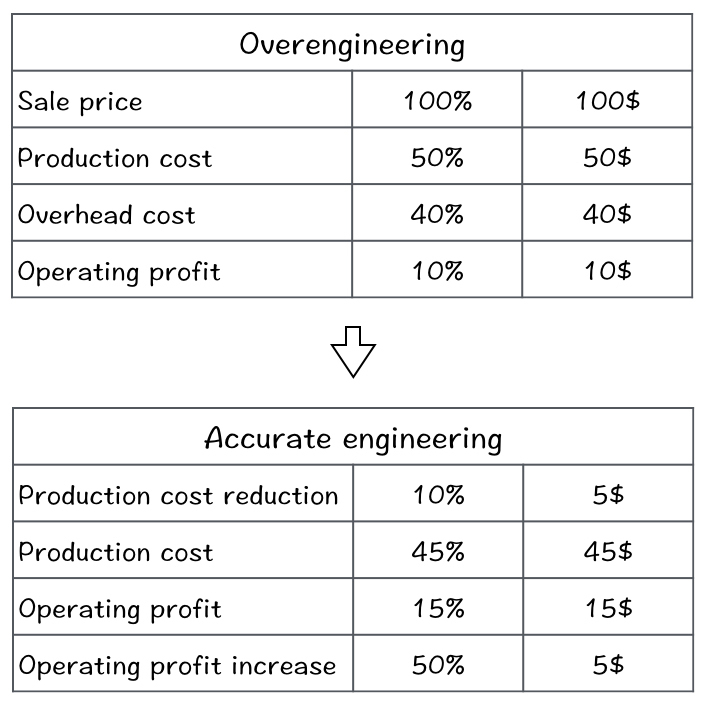 Underestimating the time and cost of the production implementation work is a common grave mistake. The production implementation might seem like a straightforward process, but it can take 3-4 times longer than the R&D stage. The reason for this miscalculation is what I call the “trip planning syndrome.” You cannot plan everything in advance; there are always surprises and unexpected failures. As Pareto claimed, it’s the small (and hard to predict) things that cost the most. Here is a list of common potential issues and failures to help you prepare your production implementation work and reduce costly breakdowns. Design-To-Cost (DTC) is one of the most important aspects of a product design. After all, in an average product, every dollar in cost equals five dollars in sales (see calculation). Most product designers and engineers know how to design cost-effective products in terms of engineering and production but tend to overlook the other aspects of DTC. In this article, I list the main components of DTC and explain how to deal with them during the product design process. Any business is, first and foremost, based on people. Having the right people on board is a key factor for success. Recruiting a new employee or a freelancer is always difficult and crucial. Hiring a product designer is no different than any other profession. However, there are some unique aspects that need to be considered when hiring a product designer (as an employee or a freelancer). In this article, I list ten product designer characteristics and skills and explain how to approach each of them in the recruiting process. Preliminary to the recruiting process, you have to define the product designer’s job and your expectations, and to prioritize the value of each of the below list aspects accordingly. People tend to think that designers’ chief skills are creating skills – ones that require mainly artistic hands and trained eyes. Although these skills are crucial, designers’ most important skills are mental and cognitive ones. The ability to recognize a need or an opportunity, to imagine a solution and to translate an idea into a product, requires much more than great sketching and visualization abilities. In this article, I review seven different designers’ skills that can contribute to any profession – skills that are obvious for designers, but might be refreshing and valuable for non-designers. A typical product design process is a knowledge-driven process with very little data involved. Product designers and engineers tend to trust their knowledge and expertise as the main resource for product design decision-making and product brief writing. Involving data in a product design process can improve the design quality, reduce costs and shorten time-to-market. In this article, I’ll explain what a data-driven product design is, what its benefits are, why it’s not common, and how to implement this useful method. What is the difference between data and knowledge in the context of product design? Data is a collection of individual facts. For instance: a list of materials’ prices. Knowledge is a meaningful acquaintance with facts, principles, methods, or practices to understand or perform a specific subject. For instance: the ability to choose the right materials for a product. Physical products are an inseparable part of human history. From ancient tool makers to modern mass manufacturers, physical products were always intended to extend and improve the human body, giving us the ability to do things better, faster, stronger, easier, etc., in a way we wouldn’t be able to do otherwise. There are only two types of tools that extend the human mind: writing and software. The invention of writing enabled, for the first time in history, humans to keep thoughts, ideas, and information external to the human brain. That was a major step in our evolution. The software took these capabilities a few steps further by enabling a much more powerful tool to store and use data and make calculations. Physical products and software products are very different from each other. One has a body and it follows the rules of physics, while the other has no body and is based on logic. For many years, these two types of products lived in separate worlds. Today, the borders between them are fading. The Internet, the Internet Of Things (IOT), Wearable Computing, and the low cost of microprocessors allow for more and more physical products to also become software products. In this article, I’ll describe some of these main product aspects and discuss the differences between physical products and software products. In this post I’d like to share with you a list of the ten most important questions any product design manager should ask and answer before and during a product design process. This article is about CAD management as part of product design process. I gathered some working methods, guidelines, and tips for working with CAD. It is not a specific CAD “how to” manual, but a general CAD working methods and ideas to help you when working with your CAD. This time, I’d like to share some of my best nonfiction reading with you. Here is a list of 12 recommended books for anyone who deals with product design management. These books are not about product design management, but about different related topics: innovation, marketing, management, design, engineering and even history and psychology. I can guarantee you that each of these books is interesting and enriching, for both professional and personal matters. Is it God or the Devil in the details? Perfectionism is a controversial character trait. In the context of product design and product design management, some consider it as a must-have trait, and some see it as a burden. Some product designers try to learn how to be more of a perfectionist while others try to avoid the same. Is it God or the Devil in the details? In this article, I’ll discuss the pros & cons of perfectionism for product designers, engineers and product design managers, from professional and practical perspectives. The only good aspect of perfectionism is that is causes a person to aim to produce the best results possible — a perfectionist will not compromise and will keep working on all details until the product is perfect. For non-perfectionists, ‘90% perfect’ might be good enough. But for a perfectionist, skipping that final 10% is not an option; they will keep working and working until 100% has been achieved. In many cases, this last 10% can make a big difference in a product’s quality. In this matter, perfectionism is a valuable trait, and it can help in achieving better products. Read more…Is it God or the Devil in the details? A successful product requires more than just design and engineering. A good design and smart engineering can result in a great product, but these two factors alone won’t necessarily achieve a successful one — a product that makes for good business. The bridge from a well-designed product to a successful one very much depends on Design-Marketing relationships. The common relationship between product design and marketing is complicated. In many cases, you may find a lot of misunderstandings and unorganized multidisciplinary working procedures involved in this Design-Marketing Tango. This chaotic situation can cause great damage to any Product-Design Driven company. This article deals with the integration of marketing knowledge and abilities in a product design process — the benefits you can gain from it, how to do it properly, and what to be aware of. Any product is the outcome of both the work of engineers and industrial designers. There aren’t many products that can be designed solely by engineers without designers, and vice versa. In a product design project, the engineers and the designers work shoulder to shoulder, and they both responsible for designing the product, but do they see the design work eye to eye? Engineers are from Mars and designers are from Venus; they do not share the same background, and they do not speak the same language. They even think differently. They see products in very different ways and tend to misunderstand each other’s perspectives. Engineers see designers as unrealistic visionaries and designers see engineers as shortsighted technocrats. I made these two lists to help engineers and designers to close the gaps between the two disciplines and to cooperate better as a design team in a product design project. Ergonomics is a scientific discipline concerned with interactions among users and products or systems. This is why it’s also called Human-Engineering or Human-Factors. In a product design process, ergonomics deals with designing the most efficient and fluent solutions for user/product interactions. The term “ergonomics” is most familiar with the aspects of product/human-body fit. Manufacturers of products with significant interaction with the human body, such as shoes, working tools, and computer keyboards, understand the need and the value of ergonomics; but what about products with no product/human-body interaction? Do they have to be ergonomically designed? The answer is – yes. Let’s see why. Over-engineering is the silence product’s failure. It inhibits business growth for product design and manufacturing companies, especially for ones that deal with capabilities and performance oriented products. Unlike under-engineering, over-engineering is not easily recognized; this is why it can exist for long time. Over-engineering is not an engineering failure but a management one. Therefore management actions should be taken to deal with it. When defining and characterizing a product in a product design process, there are two different types of product’s attributes that have to be considered – the Hard-Attributes and the Soft-Attributes. These two attributes are radically different in nature. Not distinguishing between them and treating them evenly is a common mistake. This article describes the differences between these two types of attributes and explains how to properly manage each of them. What is the difference between hard and soft attributes of a product? Hard-Attributes are objective and measurable, and have to do principally with the functioning and performance of a product; for example, strength, speed, weight, and price. They are mainly the purview of engineers. In contrast, Soft-Attributes are subjective and emotional. They are described using words like attractive, young; sporty, pleasant, and feminine, and cannot be quantified or measured by objective means. For the most part, these attributes have to do with the character of the product and its user-experience. Soft-Attributes are mainly the purview of industrial designers. A BOM (Bill Of Materials) is the “recipe” of a product. BOM data is at the hub of any product design and manufacturing business – R&D, manufacturing, logistics, procurement, inventory, pricing, and sales are all dependent on BOM data. Products cannot be produced without a BOM, and BOM mistakes are costly. Yet, in many R&D projects, BOM management is overlooked, and the BOM is treated as a list instead of as a management tool. There are three main reasons for this oversight: 1. BOM management is tedious work that no one wants to deal with. 2. There are no powerful and friendly BOM management tools. 3. The value of BOM management (as opposed to BOM listing) can be vague. What is the difference between listing and managing the BOM data? The new-product development process is complex and multi-dimensional. It requires considerable professional expertise and the ability to make decisions in uncertain situations. Though trial and error is an integral part of the process, it is both possible and advisable to avoid common mistakes that might cause significant loss of time and money. The following is a list of 10 common mistakes and misconceptions often made during the product development and design process. The first step to avoiding them is being aware of them. Product Matrix is a simple method for optimizing the product range of a company and defining the products’ main features – a method that can both save a lot of money and increase sales. In this article, I’ll describe what a Product Matrix is and how to use this method. What products should we develop next? This is one of the major questions that PDD companies keep struggling with. Should we make a rich featured product or a light version? Should it be an expensive or cheap one? New product or new series? These are all crucial questions that bother any PDD company, and they are questions with enormous impact on the entire business. Product-design driven (PDD) companies achieve their advantage mainly through innovation and high quality product design. A company does not become a PDD company by chance, nor by high quality product design capabilities. PDD is a strategy. Like any other business strategy, it should be built from the top down and it requires vision, plan, budget, and execution. In this article, I’ll shortly describe the 10 main conditions and actions required for implementing a PDD strategy in a company. What is Product-Design Driven Strategy? Business and marketing strategy is perhaps one of those things that differentiate leading companies from others. Successful companies tend to adopt one of the four strategies known as the four P’s – price, promotion, place, and product, as a main strategy, to run and grow their business. Let’s see how these strategies work for companies that sell (physical) products. The price strategy is about attracting customers with good prices, by selling at lower price than competitors. This strategy is common in commodity product markets or among companies that bring production efficiency to its highest levels (IKEA). Big quantities and efficiency are prerequisites to succeed with this strategy. Read more…What is Product-Design Driven Strategy? What is Product Design Management? Product Design Management (PDM) is one of the most important elements in the successful business of designing innovative products for production. Unfortunately, most companies do not really understand the importance of PDM or how to properly implement it. In this post, I will define what PDM is and distinguish it from Product Design. In order to understand what PDM is, we first have to look at the history of product design and the evolution of the product designer. According to Wikipedia, “Product design is the process of creating a new product to be sold by a business to its customers.” That’s a pretty good definition. However, to understand the nature of today’s product designer, we have to go back to the origins of product design. Let’s go back 2.5 million years to the prehistoric tool-maker, the ancestor of today’s product designer. Tool-making was a significant step in our evolution and it’s one of the main advantages that differentiate us, Homo Sapiens, from the animal kingdom. The caveman tool-maker made tools to extend his physical abilities – to improve his and his tribe’s abilities for fighting, hunting, eating, carrying and so forth. The sole effort and focus of the tool-maker’s work was on the product and the production process. There was nothing else to deal with. The next step in the product design evolution was the artisan or craftsman. Artisans (such as blacksmith, carpenter and potter) were the dominant designers and producers of consumer products prior to the Industrial Revolution. In some respects, there were no significant differences between the artisan’s and the tool-maker’s ways of working. In both cases, design and production were integrated into a single process, carried out by the same individual. Hands-on skills were the “designer’s” most important capability, and each product was manually produced and controlled by the master himself. The product and the production process were the center of the “business” for the artisan, as well as for the tool-maker. Read more…What is Product Design Management?